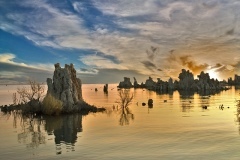 The Points of Interest in Mammoth Lakes and its surrounding area are plentiful and varied. From "Ghostly" Bodie State Historical Park to breathtaking Mono Lake to the majesty of Mammoth Mountain, area sights abound. Children and adults will be fascinated by the historic and environmental value of the Eastern High Sierras. Mono County Courthouse - Located in Bridgeport and built in 1880, this is the second oldest courthouse in California. Open daily during business hours. Inyo Craters - These youngest of volcanic features in the area are evidence of activity which occurred 500 years ago. Small lakes rest about 100 feet below the edges of both craters. Just north of Mammoth Lakes of Highway 395. Earthquake Fault - On the drive to Mammoth Mountain, this 50-foot split of hardened lava is believed by some scientists to be a cooling fissure; others theorize it was caused by movement associated with rise of the Sierra. Hot Creek Geologic Site - Boiling hot springs, fumaroles and periodic geysers are found here. High concentrations of chemicals and scalding water make swimming risky and undesirable.